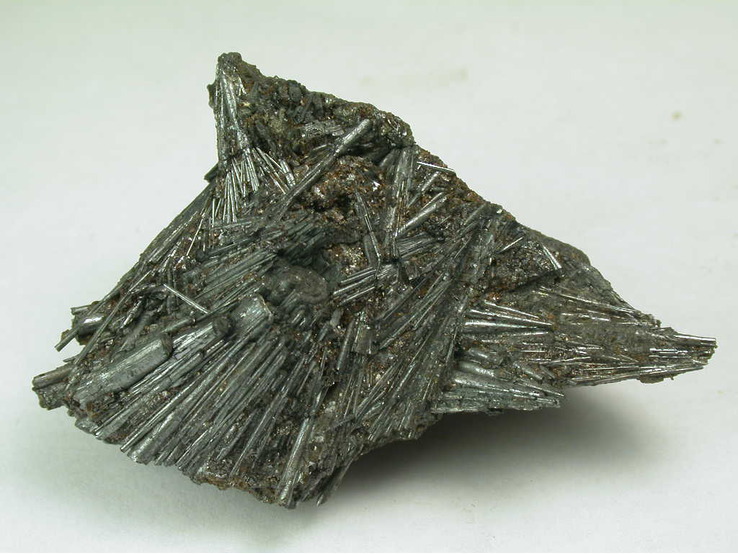 Cylindrite: Mineral information, data and localities. From the Greek κύλιυδροσ, a roll, in allusion to the typical cylindrical habit of the mineral. There is a relation between the cylindrical morphology and crystal structure. The latter is composite and characterizes in incommensurate modulations. There are two types of sheets, a pseudohexagonal one and a pseudotetragonal one, both with distinct lattice parameters. Crystals' core has different structure than its outer zone: the b and c axes of the two sheets are nearly parallel, but the more far from the core the more clear sheet rotation is observed. Layer curving is one of the ways of an accomodation of the dimensional sheet misfit by a cylindrite crystal. Extremely weak: Parallel to elongation gray-white, perpendicular to the elongation, darker gray-white. Stronger in oil. Massive. Cylindrical forms separating under pressure into smooth, concentric shells. Spherically-grouped aggregates. Incaite 5 photos of Cylindrite associated with Incaite on mindat.org. Pyrite 5 photos of Cylindrite associated with Pyrite on mindat.org. Sphalerite 4 photos of Cylindrite associated with Sphalerite on mindat.org. Stannite 3 photos of Cylindrite associated with Stannite on mindat.org. Wurtzite 2 photos of Cylindrite associated with Wurtzite on mindat.org. 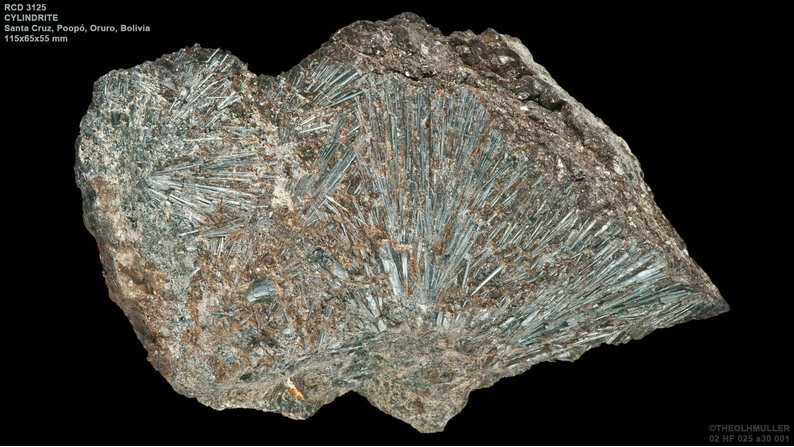 Potosíite 1 photo of Cylindrite associated with Potosíite on mindat.org. Franckeite 1 photo of Cylindrite associated with Franckeite on mindat.org. Frenzel (1893), Jb. Min. : II: 125 (as Kylindrite). Prior (1904), Mineralogical Magazine: 14: 25. Moritz (1933), Jb. Min., Beil.-Bd. : 66: 205. Palache, Charles, Harry Berman & Clifford Frondel (1944), The System of Mineralogy of James Dwight Dana and Edward Salisbury Dana Yale University 1837-1892, Volume I: Elements, Sulfides, Sulfosalts, Oxides. John Wiley and Sons, Inc., New York. 7th edition, revised and enlarged: 482-483. Makovicky, E. (1971): Microstructure of cylindrite. Neues Jahrb. Mineral. Monatsh. 1971, 404–413. Makovicky, E. (1974): Mineralogical data on cylindrite and incaite. Neues Jahrb. Mineral. Monatsh. 1974, 235–256. Makovicky, E. (1976): Crystallography of cylindrite. Part I. Crystal lattices and incaite. Neues Jahrb. Mineral. Abh. 126, 304–326. Williams, T.B. and Hyde, B.G. (1988): Electron microscopy of cylindrite and franckeite. Phys. Chem. Minerals 15, 521–544. Wang, S., Kuo, K.H. (1991): Crystal lattices and crystal chemistry of cylindrite and franckeite. Acta Crystallographica, A47, 381-392. Wang, S., Buseck, P.R. (1992): Cylindrite: The relation between its cylindrical shape and modulated structure. American Mineralogist: 77: 758-764. The following Cylindrite specimens are currently listed for sale on minfind.com. 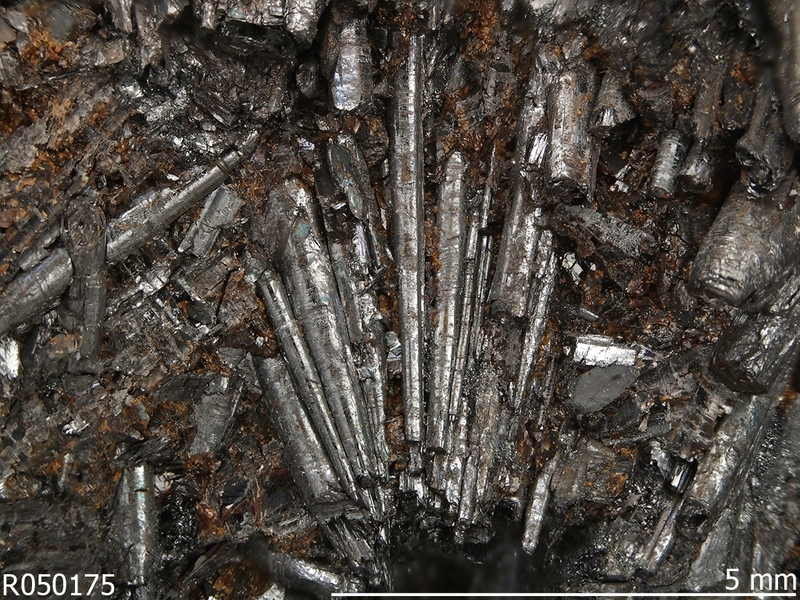 DE BRODTKORB, Milka K. Precious metaltellurides and other Te-bearing minerals in different paragenesis of Argentina: A review. Rev. Asoc. Geol. Argent. [online]. 2009, vol.64, n.3, pp. 365-372.; Paar, W. H., Putz, H., Topa, D., de Brodtkorb, M. K., & Sureda, R. J. (2005, January). Occurrence and paragenesis of tellurium in mineral deposits of Argentina. In Mineral Deposit Research: Meeting the Global Challenge (pp. 1419-1422). Springer Berlin Heidelberg. ; Board, W. S., Kennedy, B., & Yeomans, T. (2011). NI 43-101 Technical Report on the Pirquitas Mine. Amer.Min. (2000) 85, 1066-1075; Paar, W. H., Putz, H., Topa, D., de Brodtkorb, M. K., & Sureda, R. J. (2005, January). Occurrence and paragenesis of tellurium in mineral deposits of Argentina. In Mineral Deposit Research: Meeting the Global Challenge (pp. 1419-1422). Springer Berlin Heidelberg. ; Paar, W. H., de Brodtkorb, M. K., Sureda, R. J., & Topa, D. (2010). Mineralogy and chemistry of tin and lead sulfides and sulfosalts in the Pirquitas Mine vein deposit, Jujuy, Argentina (22° 41'S-66° 28'W). Andean Geology, 28(2), 259-268. Petrov, A., & White, S. (2001). Kylindrit von der Itos Mine, Oruro, Bolivien. MINERALIEN MAGAZIN LAPIS, 26(9), 27-29. C. J. Andrew and J. H. Ashton (1985) Trans. Inst. Mining Metall., sect. B, 94, 66-93; C. J. Andrew (1986) pers. comm. ; Ryback, G., Nawaz, R. and Farley, E. (1988) Seventh Supplementary List of British Isles Minerals (Irish). Mineralogical Magazine, vol. 52, n° 365, pp. 267-274.
http://www.igem.ru/igem/chem/pt/sukhloge.htm; Distler, V. V., Mitrofanov, G. L., Yudovskaya, M. A., Lishnevsky, E. N., & Prokof’ev, V. Y. (2005). Deep structure and ore-forming processes of the Sukhoi Log gold-platinum deposit, Russia. In Mineral Deposit Research: Meeting the Global Challenge (pp. 921-923). Springer Berlin Heidelberg.